Angela Merkel’s legacy may not be all she hoped for – but her successor won’t have it much easier. Tomorrow marks Angela Merkel’s 4,748th day as German chancellor – that’s 13 years. It’s been a remarkable run for Germany’s first female chancellor, one who led Europe’s greatest power through the global financial crisis, the European sovereign debt crisis and the refugee crisis. For nearly half that time, German pundits have been predicting “Merkeldämmerung,” Merkel’s twilight. Finally, it has arrived. In late October, amid historically low approval ratings for her Christian Democratic Union party, Merkel announced that she would not seek the position of party chief again. The CDU will vote on her replacement in just over two weeks. The winner of that race will be the favorite to replace Merkel as chancellor in 2021 – if her government makes it that far. Merkel will hardly be remembered for leading Germany out of its difficult post-reunification years and into a time of great prosperity, though she did. (In August 2018 unemployment in the country was at 5.2 percent, the lowest level since reunification, and down from 11.5 percent in November 2005.) Instead, she will forever be known as the chancellor who offered up German savings to defend the eurozone. That series of decisions culminated in the move to bail out Greece in 2015 rather than allow a Grexit and in the process gave rise to the far-right Alternative for Germany party, which has sapped the CDU’s support. Merkel also will be remembered for refusing to close Germany’s borders during the 2015 Syrian refugee crisis (a call that was short-lived and mischaracterized as “opening the borders” – Europe’s internal borders were already open), allowing more than 1 million people to enter the country in a span of two years. Before those critical decisions, the CDU had for a couple of years consistently polled above 40 percent; today its approval is in the mid-to-high 20s, an all-time low. It would have been extraordinarily difficult for any German leader to have acted otherwise. Saving Greece – at what will probably prove to be a prohibitive cost for the Greeks – may have prevented the collapse of the eurozone. And without the eurozone’s ease of trade, the German economy would suffocate. When Germany opted to temporarily waive EU asylum procedures for Syrian applicants, it opened a relief valve for the overwhelmed Hungarian government. Once asylum-seekers in Hungary began marching toward the Austrian border, there was no realistic way to stop them short of border closures, which would have rippled throughout the Schengen zone and disrupted vital trade. These decisions took courage, but they were the least-bad options available. They also proved to be political suicide. Difficult decisions abound for the next chancellor. Germany’s export-oriented growth model has taken the economy to new heights, but it is now dangerously unbalanced at a time when global consumption is slowing. If the German economy can’t adapt to the 21st century, it will lose its place. 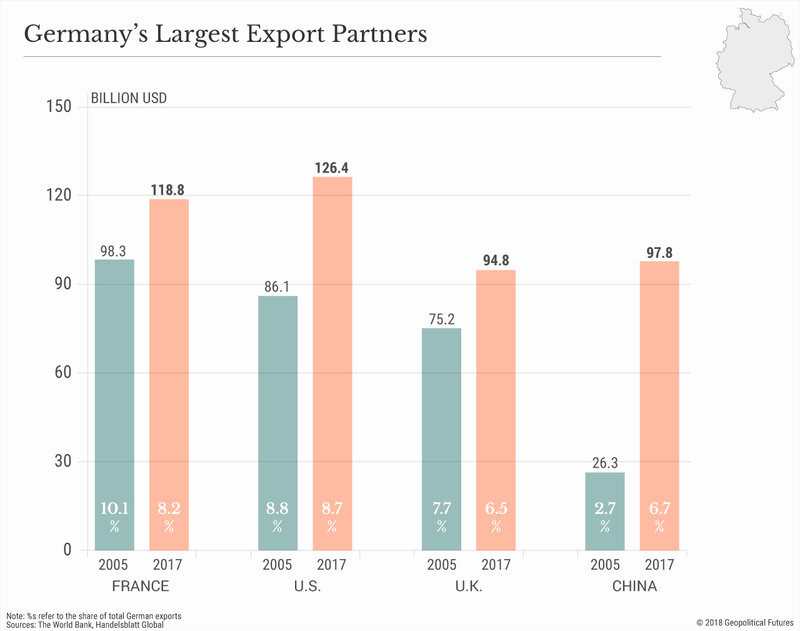 The United States and Asia, especially China, have a head start in the sectors that will define the future, and Germany will need a strategy – preferably a European one – for dealing with China’s economic rise. Eurozone growth is slowing, however, and the bloc hasn’t completed the reforms that would help it weather the next recession substantially better than it did the last. The U.S., meanwhile, is gradually but increasingly treating Europe, in the U.S. president’s own words, as a “foe.” Europeans are beginning to accept that this particular U.S. strategy may outlast Donald Trump. But as it was for Merkel, the course for her successor is mostly set. Efforts to modernize German manufacturing are already underway. The government has set aside 1 billion euros ($1.14 billion) for electric-vehicle battery ventures, and another 500 million euros could be made available to fund a factory researching solid-state battery technology, which is expected to supplant lithium-ion batteries. This month, Berlin announced plans to invest over 3 billion euros in artificial intelligence by 2025. That’s a start, but the German economy still relies far too heavily on exports. According to the World Bank, more than 47 percent of Germany’s gross domestic product came from exports in 2017, the highest level of any major economy. 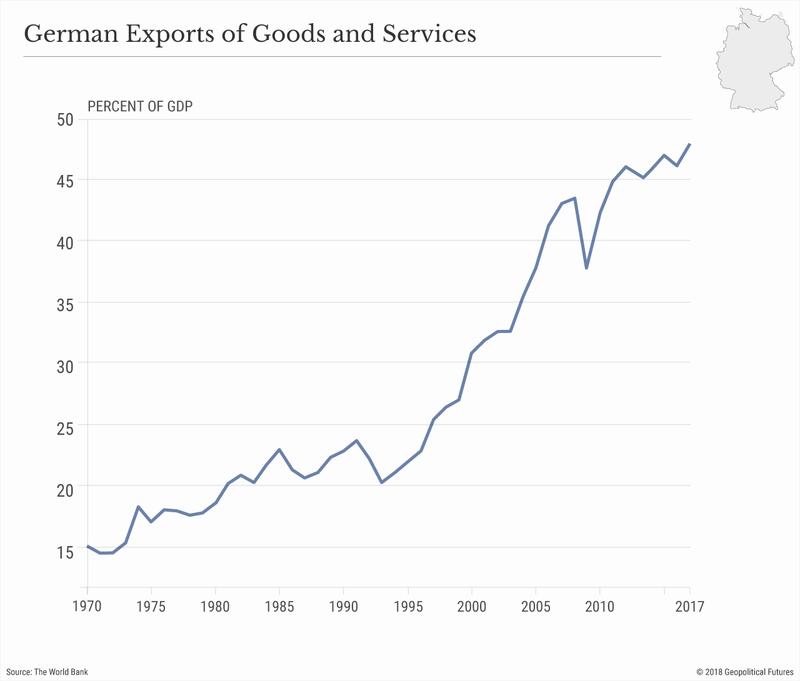 The Great Recession could have been a moment of reflection for Germany, but it wasn’t – exports rebounded quickly, and the Germans concluded that their economic model works just fine. The next crash could be different: The U.S. has become more protectionist, and China isn’t buying German cars at the rate it used to. The necessary reforms will be every bit as painful as the decisions Merkel made in 2015; they will require Germans to do nothing less than redefine who they are. Berlin, therefore, is unlikely to embrace change until a crisis makes it unavoidable. The trouble is that in the midst of such a crisis, the eurozone will necessarily be in recession. Germany is the eurozone’s growth engine, so a slowdown there drags everyone down. And Europe is not significantly better prepared to deal with a serious recession today than it was a decade ago. Three member states – Greece, Spain and Italy – still have double-digit unemployment rates. As of 2017, youth unemployment was above 20 percent in eight EU member states, compared with 9.2 percent in the U.S., and in the second quarter of this year, Greece, Italy and Portugal had public debt levels well over 100 percent. France has been pleading with Germany to help push through reforms, like the establishment of a joint banking union and an EU finance minister, to no avail. (Berlin has finally accepted Paris’ call for a euro-area budget, but it’s nowhere near the amount France wanted.) And the popularity of euroskeptical governments could elevate the risk of miscalculation and catastrophe in future bailout negotiations, not unlike what happened when the Syriza party came to power in Greece in January 2015. When judgment day comes, the next German chancellor may have to expend precious political capital rescuing fellow eurozone members while Germans themselves are hurting. But Merkel could not let the euro collapse, and neither can her successor. The next chancellor will also have to find Germany’s, and Europe’s, place between a rising China and the United States. Germany had high hopes for economic relations with China. In 2005, only 2.8 percent of its exports by value were bound for China; in 2017, that number was 6.7 percent, making China Germany’s third-largest export destination after the U.S. and France. Today, however, government and business opinion has started to turn against China. Chinese investments in certain sectors are viewed with suspicion, and the country is increasingly seen as a competitor for other markets. According to Reuters, the influential Federation of German Industries is preparing a position paper warning German firms to reduce their dependence on the Chinese market, which the federation says is unlikely to open up as Beijing has promised. Berlin is also working on plans to give it more veto power over foreign investments in strategic sectors, a measure aimed mostly at China. At the same time, senior officials are trying to block Chinese firms from constructing Germany’s 5G infrastructure. While Germany would like to get all EU member states on the same page, most imperative for Berlin is that it and the other most advanced manufacturing states align on China. So far, at least, they have. Yet German industry can’t afford to turn its back on a major market like China, especially amid trade frictions with the United States. Trump is still holding the threat of car tariffs over the heads of Germany’s proud but battered automakers, and it’s getting harder to claim that the frictions between Europe and the U.S. are only about trade and not about greater strategic disagreements. In the past year, Trump has threatened the entire EU for trying to keep the Iran nuclear deal alive, proposed a speedy free trade agreement to entice the U.K. into pursuing a looser relationship with the EU, suggested that France abandon the EU for its own trade deal with the U.S., lambasted French President Emmanuel Macron on Twitter for proposing a European army, offered to buy Italy’s public debt more or less fund to its budget fight with Brussels, and, of course, repeatedly railed against Germany for its massive trade surplus and its construction of the Nord Stream 2 pipeline project, which links the country to Russian natural gas supplies. The Cold War is over, the interests of the U.S. and Europe have diverged, and Europe’s leading powers are no longer content to be the junior partners in an alliance that doesn’t always serve their interests. Western Europe is still in the early stages of formulating its response­ – a task that will fall in part to Merkel’s replacement. Germany has had three chancellors since the Soviet Union fell. Helmut Kohl reunified West Germany and East Germany and signed the Maastricht Treaty, creating the European Union as we know it and laying the groundwork for the euro. Gerhard Schroeder presided over the euro’s implementation and rebuked the U.S. over the Iraq War. And Angela Merkel divided Germany while defending its long-term interests. From preparing Germany’s economy for the future to keeping the eurozone together to reimagining Europe’s place between the U.S. and China, whoever comes next won’t have it any easier. Today, like in the twentieth century, nationalism is tearing societies apart and dividing erstwhile allies. And the world’s major powers have largely resumed their Cold War postures, preparing themselves psychologically, if not militarily, for open conflict. History may not repeat itself, but it does frequently rhyme. Former British Prime Minister Margaret Thatcher’s famous claim that “there is no such thing as society,” but only “individual men and women” certainly rhymes with the divisive worldview and self-serving behavior of today’s populist demagogues. 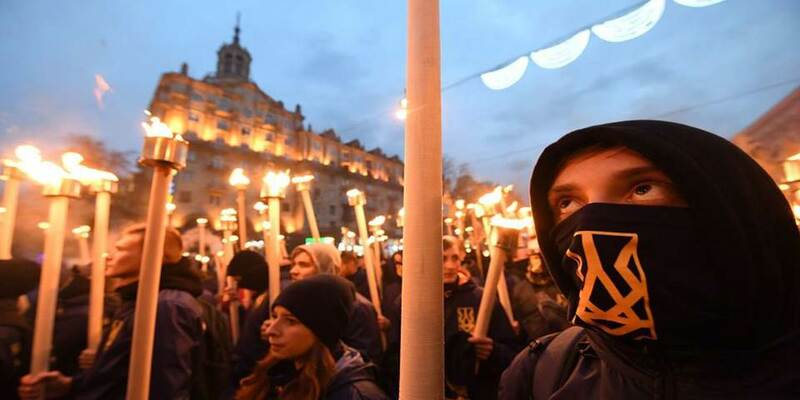 Today, like in the twentieth century, nationalism is tearing societies apart and dividing erstwhile allies, by fueling antagonism toward the “other” and justifying physical and legal protectionist barriers. The world’s major powers have largely resumed their Cold War postures, preparing themselves psychologically, if not militarily, for open conflict. As Hobsbawm predicted, skyrocketing income inequality has emerged as a major cause of rising nationalism, anti-globalization sentiment, and even the shift toward authoritarianism. Reconfirming the connection between bad economics and political extremism – highlighted by John Maynard Keynes in the aftermath of World War I – a decade of austerity in Europe has weakened the foundations of the welfare state and driven millions of voters into the arms of populists. Ironically, a major reason why today’s politics increasingly rhyme with twentieth-century developments is the fear of repeating the Great Depression – a fear that emerged after the 2008 financial crisis seemed to rhyme with the 1929 stock-market crash. Germany, for example, became obsessed with austerity, in order to ensure that runaway inflation did not contribute to dictatorship, as it had in the 1920s. But austerity went too far, enabling anti-establishment politicians to capitalize on economic hardship (along with xenophobia and misogyny) to win support. Struggling to compete electorally, many mainstream parties moved away from the center, causing the entire political field to become increasingly polarized. This trend can be seen in the United States, where, under President Donald Trump’s leadership, the Republican Party has become practically devoid of moderate voices. It can also be seen in the United Kingdom, where a more radical Labour Party under Jeremy Corbyn’s leadership faces a Conservative Party held hostage by pro-Brexit extremists. In Italy, the populist Five Star Movement and the nationalist League party have united in a flaky governing coalition following the electoral collapse of the country’s mainstream political forces. When Italian Prime Minister Giuseppe Conte proclaimed to Vladimir Putin that Russia is Italy’s “strategic partner,” it became clear that Italy, a core member of the EU and NATO, had become a potentially destabilizing power. In Spain, the People’s Party (PP) has become openly nationalist under the leadership of the hardline Pablo Casado. Prime Minister Pedro Sánchez’s Spanish Socialist Workers’ Party is the PP’s mirror image, having abandoned the centrist legacy of Felipe González in order to compete with the far-left populists of Podemos. In Germany, voters in Bavaria and Hesse abandoned German Chancellor Angela Merkel’s center-right Christian Democratic Union and its sister party, the Christian Social Union, in droves. The Greens drew votes from the more moderate Social Democratic Party, and the far-right Alternative für Deutschland gained significant ground. With the center gutted, Germany’s capacity to remain the bulwark of a united Europe is in jeopardy. Even the notion that a radical – even neo-fascist – leader could one day rule Germany again no longer looks farfetched. As democracies abandon moderation, abuses of power are proliferating, and social and political tensions are rising. In the US, Trump routinely demonizes opponents and dehumanizes marginalized groups; during his first year in office, politically motivated murders, perpetrated primarily by fanatical white supremacists, doubled. Several prominent Democrats or party supporters were recently sent pipe bombs. The risks posed by these developments are hardly confined to the countries in question. Maintaining relative global peace – or at least avoiding major inter-state wars – depends on strong alliances and leaders’ awareness of the devastation their weapons can cause. But, at a time when shortsighted, radical, and inexperienced figures are gaining power, both of these bulwarks against war have been weakened. In fact, the framework of global peace is already coming under mounting pressure. Because of Russian President Vladimir Putin’s relentless revanchism, Russia’s borders with NATO are now the sites of the most extensive military buildup since the Cold War. Making matters worse, Trump has pulled the US out of the Intermediate-Range Nuclear Forces Treaty, unraveling decades of progress on nuclear arms control. He seems to hope to force Russia (and China) into a new deal by threatening to “develop the weapons.” But he is unlikely to succeed. Whereas Ronald Reagan was negotiating with the reform-minded Mikhail Gorbachev, Trump would be facing the power-hungry Putin. The risks the world faces are compounded by new – and inadequately regulated – technologies. Cyber warfare is already a daily reality; indeed, at any moment, a cyber-attack could be launched against a NATO country, potentially triggering the alliance’s mutual-defense guarantee. Likewise, the United Nations has so far failed to overcome opposition to regulation of the use of lethal autonomous weapons based on artificial intelligence. The risk of violent conflict will continue to rise as the effects of climate change intensify. Among other things, massive desertification in the Middle East and Africa would bring famines that dwarf those of the twentieth century in scale. Human migration would surge, and struggles over resources would intensify. Despite efforts to secure multilateral cooperation, in today’s Hobbesian world, the slide toward climate chaos seems unstoppable. The challenges facing the world today would have been unimaginable in the twentieth century. But the underlying political dynamics are all too familiar. It is time for us to take stock of what those dynamics portend, and take seriously the lessons historical memory holds. (Reuters) – Sales of new U.S. single-family homes tumbled to a more than 2-1/2-year low in October amid sharp declines in all four regions, further evidence that higher mortgage rates were hurting the housing market. (Zero Hedge) – The October advanced trade balance (deficit) of goods worsened to $77.2 billion ($77.0 billion expected) from $76.3 billion in September. • Imports rose 0.1% in Oct. to $217.764b from $217.554b in Sept.
• Exports fell 0.6% in Oct. to $140.517b from $141.303b in Sept. In December 2016, the US goods trade deficit was $63.485 billion. In October 2018, the US goods trade deficit is $77.2 billion. A dramatic rise of almost $14 billion since Trump’s election and trade war started. (CNBC) Federal Reserve Chairman Jerome Powell said Wednesday he considers the central bank’s benchmark interest rate to be near a neutral level, an important distinction from remarks he made less than two months ago. “Interest rates are still low by historical standards, and they remain just below the broad range of estimates of the level that would be neutral for the economy — that is, neither speeding up nor slowing down growth,” Powell told the Economic Club of New York in a speech being closely watched in what has become a volatile financial Marketplace. The chairman’s observation on rates in early October helped set off a rough period on Wall Street, after he said the Fed was “a long way” from neutral. Major averages dipped briefly into a 10 percent correction and worries grew that more rate hikes might meaningfully slow down the strong economic growth of the past two years. President Donald Trump has stepped up criticism lately about both the central bank and Powell. Trump has gone beyond criticism of the rate hikes and has even objected to the Fed’s balance sheet unwind, in which it is reducing the size of the bond portfolio it accumulated when trying to stimulate the economy. From here on out every Fed meeting will be an adventure. Deutsche Bank DB +2.33%▲ stock got hit again this week for its links to the vast money laundering probe at Danish lender Danske Bank .What investors didn’t notice was the German bank quietly getting on with a critical bit of its repair job: sorting out its funding. Low-cost funding was once Deutsche’s competitive advantage, but in recent years its costs have shot up, making clients take their business elsewhere. The lender has struggled to bring them down, in part because of its own troubles but also because of how rules have changed to ensure banks don’t need bailouts in future crises. 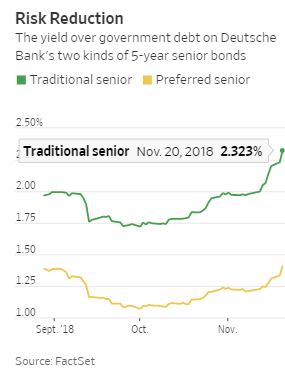 For many European banks, these changes created two kinds of senior bond for banks. One is a preferred bond, ranking in line with deposits and derivative contracts, it is very safe and cheap; the other is a non-preferred senior bond that is more likely to suffer losses in a crisis and so is more expensive. For both types there can be derivative contracts that protect investors against default. The problem for Deutsche is that it has only just started issuing preferred bonds; German legislation enabling them was only passed in July. This means there isn’t yet any credit default swap on them. This might sound highly technical, but default swaps are the main vehicle for clients—including hedge funds, depositors and other banks—to put a price on the counterparty risk of trading with Deutsche or giving it deposits. Deutsche’s counterparty risk is far higher than it needs to be and that has been costing it business. On Monday, Deutsche launched a tender offer to buy back up to €1 billion ($1.14 billion) of its traditional non-preferred bonds. It should make an immediate gain on the difference between their value and what it pays for them. Barclaysanalysts estimate the gain at a little over €60 million before tax. More significant, though, is that Deutsche wants to replace a good chunk of the non-preferred bonds with new, preferred ones. These will be cheaper to service and when enough are in issue, a market should develop in related default swaps. BNP Paribasalready has default swaps trading against traditional senior and senior preferred bonds. 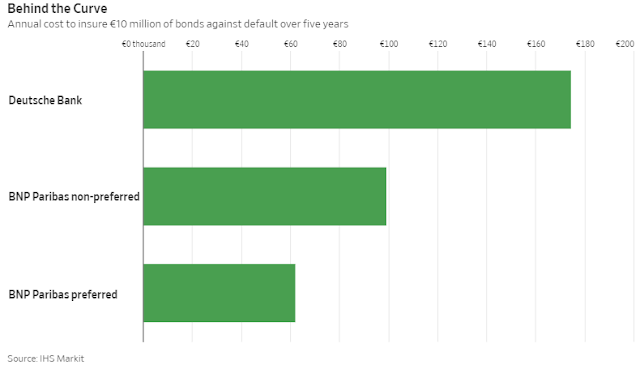 The cost of protecting BNP’s preferred bonds against default is less than two-thirds of the cost for its traditional bonds, according to IHS Markit . For Deutsche, the yield on new preferred bonds it issued in August is much lower than that on its existing bonds. A default swap based on the preferred bonds should cost less too. As Deutsche battles to stem its revenue losses, anything that makes it more attractive to trade with can’t come soon enough. Ten years ago, the George W. Bush administration played host to an unprecedented meeting. On the weekend of Nov. 14 and 15, 2008, the heads of the G-20—a group of leaders from 20 large economies who had never previously been treated as a collective—assembled for the first time in Washington to coordinate a response to the rapidly growing global financial crisis. The upcoming meeting in Buenos Aires on Nov. 30 will be its 13th since 2008. It’s an unabashedly exclusive club—even the United Nations secretary-general attends as a guest, not a full member—and has quickly become one of the most potent symbols of globalization. Its authority is demonstrated by the blanket of security that surrounds it and the mass anti-globalization protests, most recently in Hamburg in July 2017, that regularly try to disrupt it. Ultimately, however, it is both more and less important than its critics and supporters allege—and given the present structure of the global economy, it is difficult to imagine an alternative. The G-20, in short, is the form of global governance the world currently deserves. The G-20 concept was originally gestated in crisis—not that of 2008 but of the late 1990s. The story goes that, in the wake of economic meltdowns in Asia and Russia, then-U.S. Treasury Secretary Larry Summers tasked his deputy Timothy Geithner, together with his German counterpart, Caio Koch-Weser, with compiling a list of major global players who should make up a decision-making forum more exclusive and flexible than the U.N. Going down a table of population and GDP, they ticked France and South Africa in, Nigeria and Spain out. The result was a grouping dominated by the G-8 and the so-called BRICS (Brazil, Russia, India, China, and South Africa), with the addition of newcomers to the top table such as Saudi Arabia, Indonesia, Argentina, Mexico, and Turkey. This proto-G-20 was a regular meeting of finance ministers and accordingly low-key and technical in atmosphere. There were some, like the Canadians, who pushed from the start for the G-20 to be upgraded to a meeting of higher-level leaders. But the Bush administration resisted, preferring to cultivate coalitions of the willing and to open a new era of G-2 diplomacy with China. The 2008 gathering was a surprising last-minute turn to multilateralism on the part of a Bush presidency better known for its unilateral approach. Exceptional times, however, called for an unusual response. In September and October 2008, the world economy had experienced the closest thing in its history to a collective financial heart attack. All the major banks on both sides of the Atlantic had been shaken to their foundations. National governments everywhere were scrambling to the rescue of their financial institutions. But they were doing so in an alarmingly uncoordinated fashion. It was not until Oct. 13, 2008, that Europe and the United States managed to hammer out a coordinated program of capital injections and bank guarantees. Behind the scenes, the U.S. Federal Reserve was pumping dollar liquidity into the global banking system. But what was needed was something more political to signal the commitment to avoiding a repeat of the conflicts of the 1930s, to accelerate new regulatory action, and to unlock additional crisis-fighting resources. Leaders elsewhere recognized the same need: as the depth of the disaster became clear, President Nicolas Sarkozy of France and Prime Minister Gordon Brown of the U.K. began talking about the need for a global gathering. But creating an overtly political forum posed its own problems—namely, how to design in a way that reconciled the individual interests of its participants. The French and the Japanese wanted a relatively select group, one that would give them more weight. The Bush administration’s priority was to avoid formal cooperation with the U.N., which it feared would seize the initiative with a show-stopping global investigation into the U.S. roots of the crisis. Ultimately, the major players agreed to upgrade the existing G-20 and to link it closely to the IMF, in which voting rights are weighted by capital contribution. At the first meeting of the G-20 in Washington there seemed little prospect that it would be redrawing any maps. The format was untested and inefficient. The leaders took turns to deliver prepared statements. There was more posturing than substance. But they reached agreement on important initiatives regarding banking regulation and financial stability, which accelerated the push toward tighter banking regulation in the Basel III agreement. And the second meeting, in London in April 2009, starred new U.S. President Barack Obama and was a true global summit. Whether the resulting coordination of policy was a good or a bad thing, of course, depended on the policies that were agreed. The expansion of IMF resources at London would prove to be much needed. Less positive was the use of the G-20 to coordinate austerity. The decision at the June 2010 meeting in Toronto for all the major economies of the world to simultaneously halve their deficits was profoundly misguided. Since the G-20’s beginnings in the financial crisis, its mission has become more dilute. Its remit has expanded, and its meetings have been cut to one per year. It continues, nevertheless, to serve as a convenient venue for bilateral encounters balanced by the wider global setting. Between 2010 and 2012, it was the principal forum in which the Obama administration conducted its discreet efforts to break the deadlock in the eurozone crisis. More recently it has become the stage on which global leaders have sought to temper U.S. President Donald Trump’s program of “America First” policy and to coordinate their response. In a world of increasingly assertive nationalism, does the G-20 have a future? Almost certainly, yes—in part because its style of internationalism insulates it from nationalist pressures. As the Norwegian foreign minister noted, hierarchy is built into the G-20 model. In that sense, it marks a break with the postwar internationalist era, with its emphasis on the equality of sovereign members of the U.N. General Assembly. The G-20’s privileging of an exclusive group of major countries flies in the face of the pious fiction of equal sovereignty. But that does not make it a throwback to the 19th century, dominated by the principle of monarchical legitimacy and the “concert of Europe.” The G-20 is an authentic organization of the new era of globalization, which began in the 1990s when global growth began to take on a transformative aspect, rebalancing the hierarchy of nations. The criteria for inclusion in the G-20 are not sovereignty or political alignment but economic and demographic heft. The balance of power within the G-20 itself has shifted accordingly. At the turn of the century, when finance ministers first began to meet, the G-20’s emerging economy members contributed 25 percent of global growth as compared to a 55 percent share for the United States, Europe, Canada, Australia, and Japan. Today, their shares are 45 percent each. In the next five years, the growth contribution of the emerging economies in the G-20 will eclipse that of the slower-growing rich countries. And it is not just the raw economic balance that is shifting. Political and intellectual authority are shifting too. Both the Europeans and the Americans have found themselves under sustained criticism from Asian members of the G-20, demanding that they put their financial houses in order. The clashes at the summits in Seoul in November 2010 and at Los Cabos, Mexico, in June 2012 were particularly fierce. On the other hand, the voices of Brazil and Indonesia brought to bear in the G-20 have also prepared the way for the IMF to take a more open-minded view on the need for emerging markets to manage international capital flows. The question for the future is not where the likes of Norway fit in but how long population giants like Pakistan, Nigeria, and Bangladesh should be excluded. Egypt has four times the population of Australia, a founding member. Ethiopia has a population that dwarfs any country in the European Union and is widely touted both as a champion of East African growth and a strategic partner of China. Short of a European agreement to be represented by the EU, it is unlikely that incumbents will give up their spots. We should, therefore, expect the number of members to expand. This would widen the G-20’s base of legitimacy, even if a G-25 or a G-30 would not mark a return to the universalism of the founding moment of the United Nations or the much-lamented liberal multilateralism of 1945. But, considering 21st-century realities, those inherited models of global organization are holdovers from an ancien régime, as much as Prince Metternich’s dealings were in the 20th century. Why should a resurgent India or China with populations of 1.4 billion and rapidly growing economies agree to stand on the same level as Ireland, Uzbekistan, and Panama? The G-20 draws hierarchical distinctions and frankly recognizes the power relations of an increasingly multipolar world. In that world, size counts. The same is true in the G-20—which is why it’s here to stay.